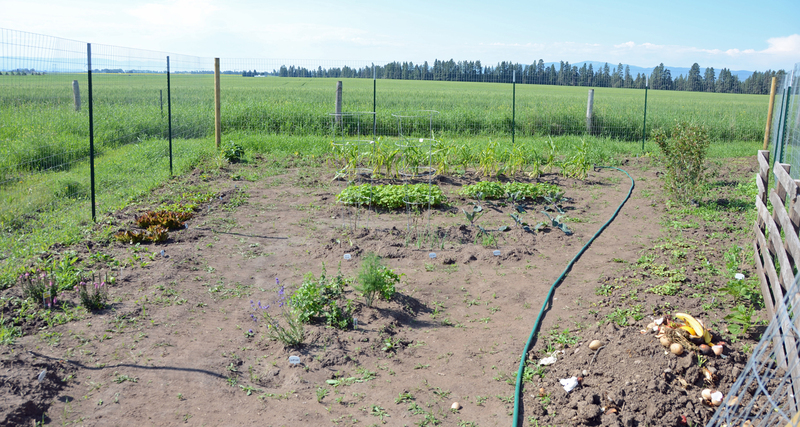 It’s been three weeks since the last garden update, and my how things have grown! I find myself grumbling about the heat, but when I am doing that I must remind myself that the heat is making my garden flourish. Some things have already started to flower/go to seed, like the dill and cilantro in the photo above. Pulled up the spinach last week, and will turn under the lettuces next week (they’re starting to get bitter, which means they’re about done). So it clearly has a ways to go yet, but it’s getting there! And it’s bigger every day. 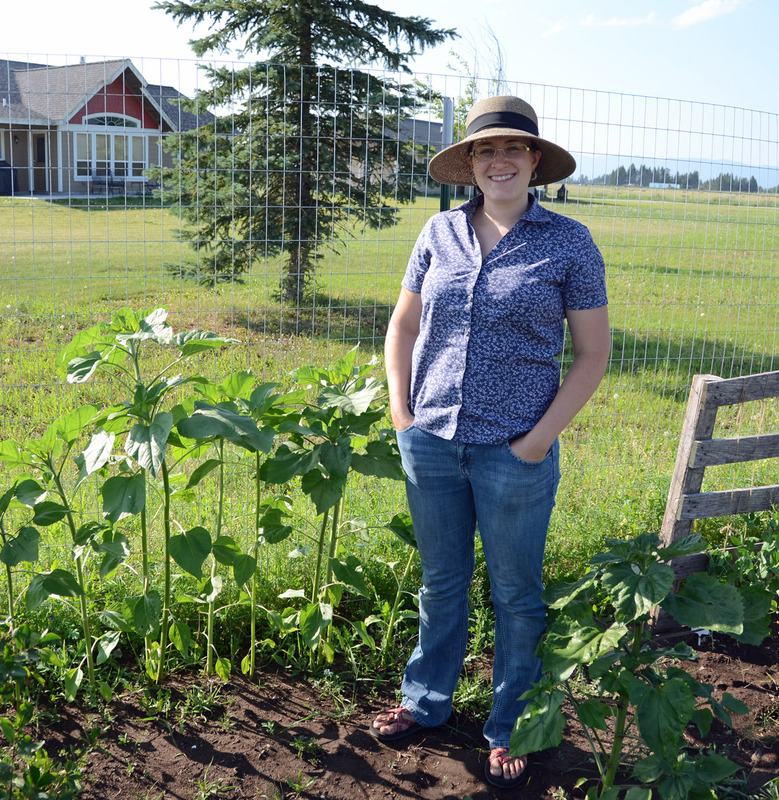 Here’s a photo of yours truly with the sunflowers for scale. I’m 5 foot 7 inches. Has a few male flowers on it, but no ladies yet. They’ll come. 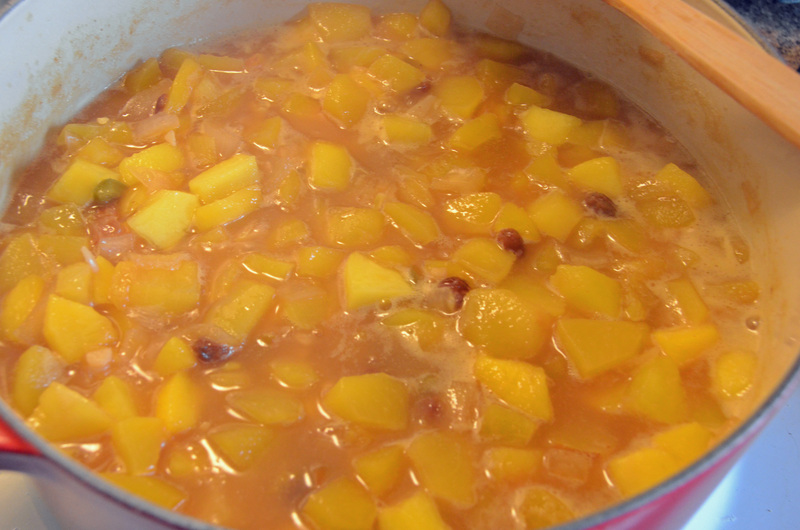 And with them, squash! Squash is probably my favorite vegetable. Acorn in particular. 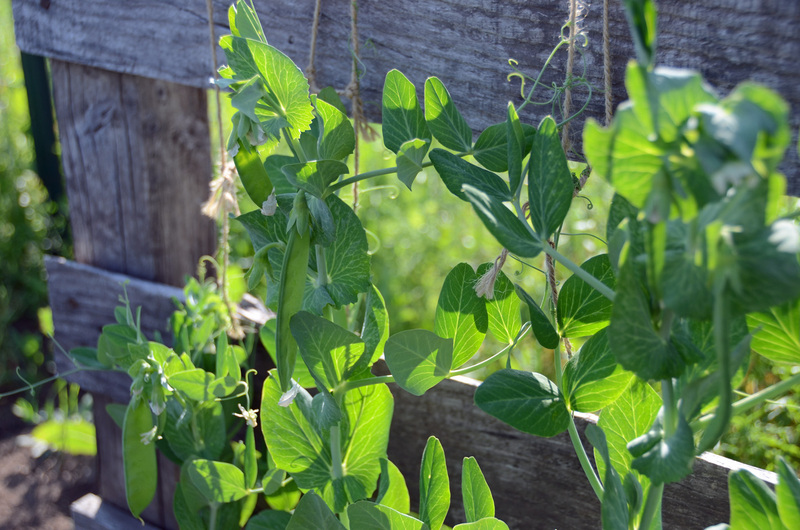 The peas finally have pods on them (I planted these about a month late), and we’ve been enjoying some in our salads for a few days. They’re really great. 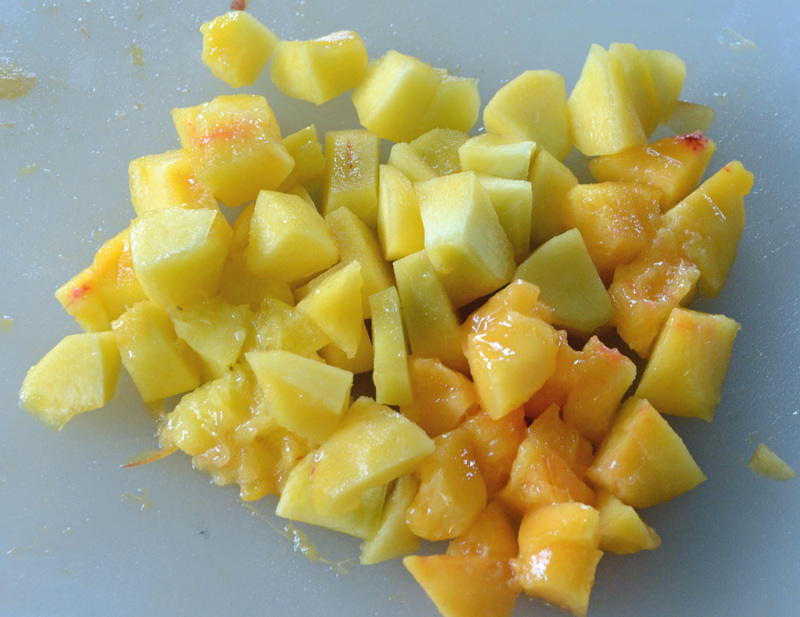 Crunchy and sweet. Oh hey there, little guy. 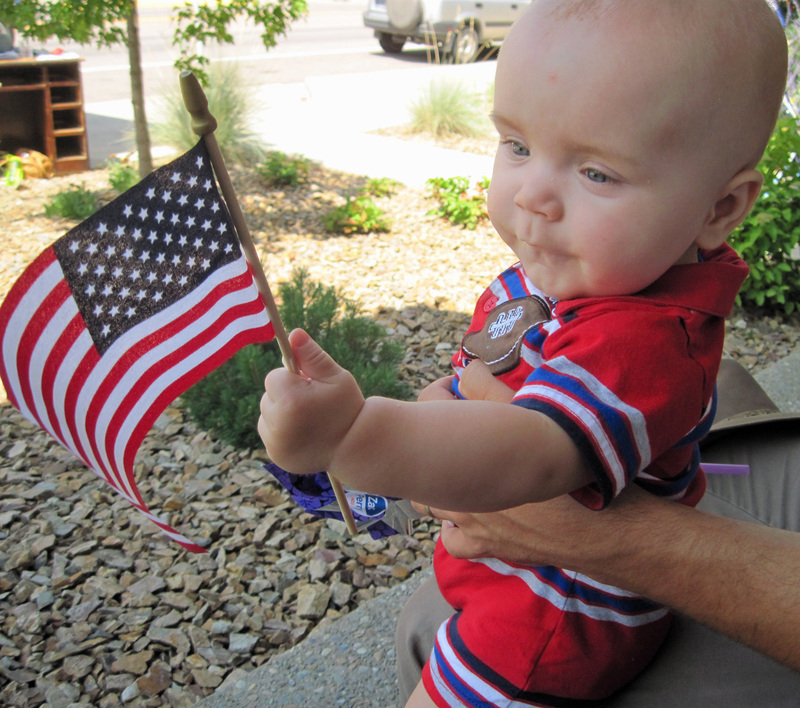 Jonathan went to his first parade today! 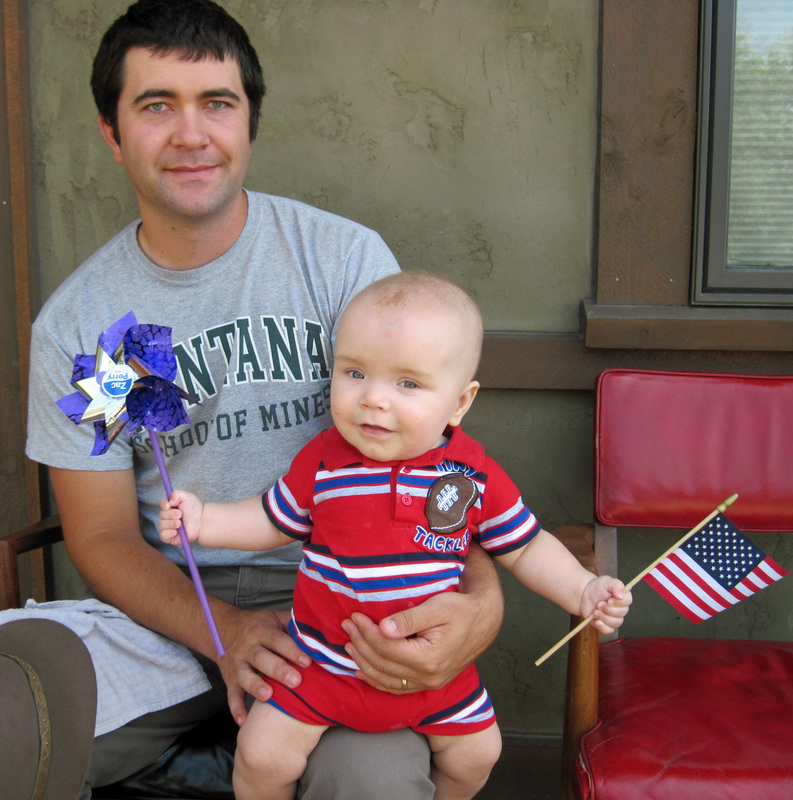 I think he enjoyed playing with the little flag and the pinwheel more than the actual parade, though. Shawn and I like finding free fun things to do. Parades with friends fit the bill! 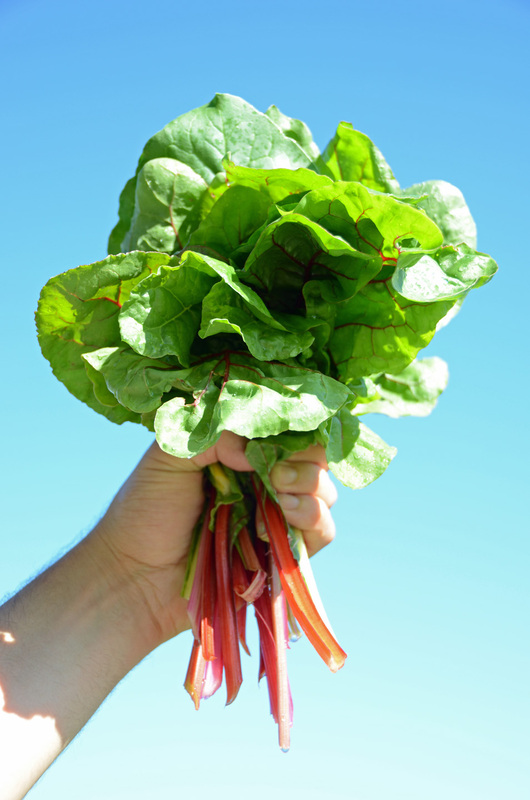 My rainbow and ruby red chard is really going to town (as is my romaine lettuce) even after repeated cuttings. So much so that when I’ve been offered lettuce the last few weeks at the farms I volunteer at, I’ve turned them down. I’ve given away a lot of it, too. Must be doing something right out there. 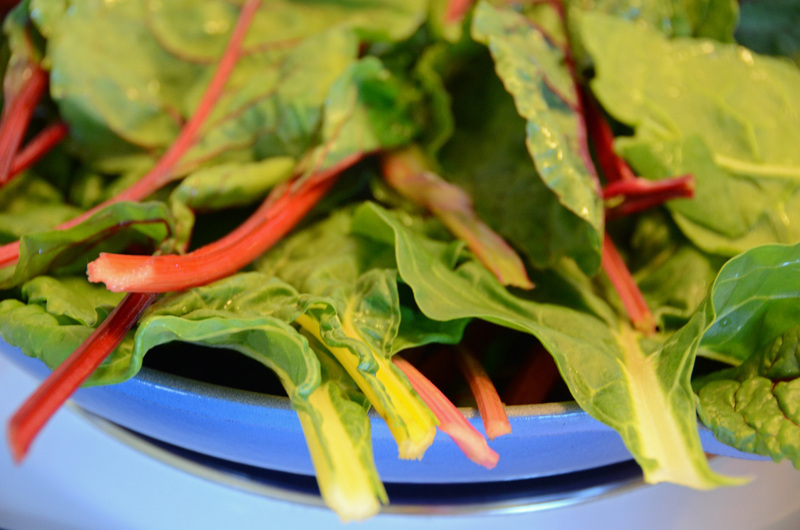 In addition to making salads with the chard leaves and stems, my husband and I also enjoy sauteing it in a skillet with olive oil, just until it’s a vibrant green. We add some garlic, sun-dried tomatoes, and pierogis (which we have to make ourselves since we can’t find them in groceries stores around here… it’s just mashed potato and onion in a dough shell… sort of like ravioli). It’s a delicious meal. 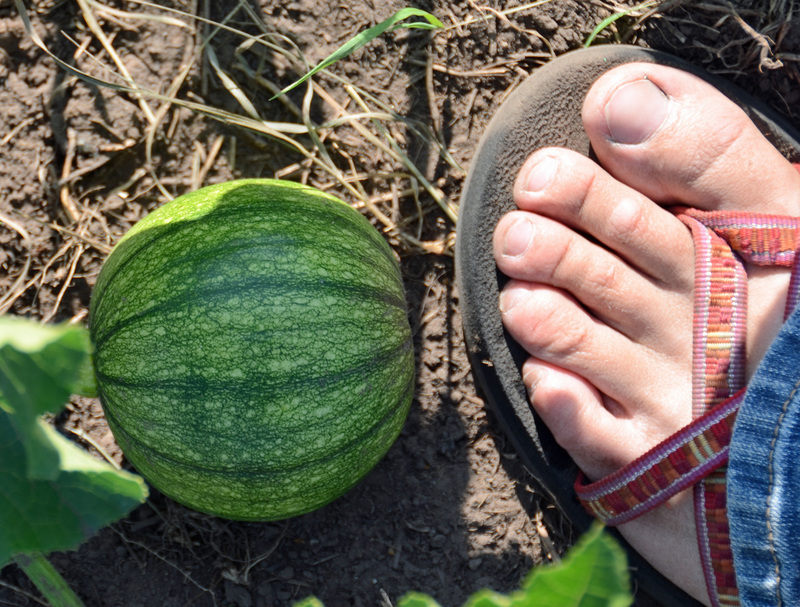 I hope your gardens are bountiful! Not only is the garden a place for plant growth, it’s a gathering place for insects and animals eager to enjoy nature’s bounty. Sometimes those animals and insects are what we consider pests, such as gophers (the war for the backyard continues!) and caterpillars in my cabbages. But many insects are beneficial in the garden. Bees have been headlining the list lately with the issues over hive collapse disorder, but other bugs are important, too. Ladybugs are a good example, because they eat aphids. 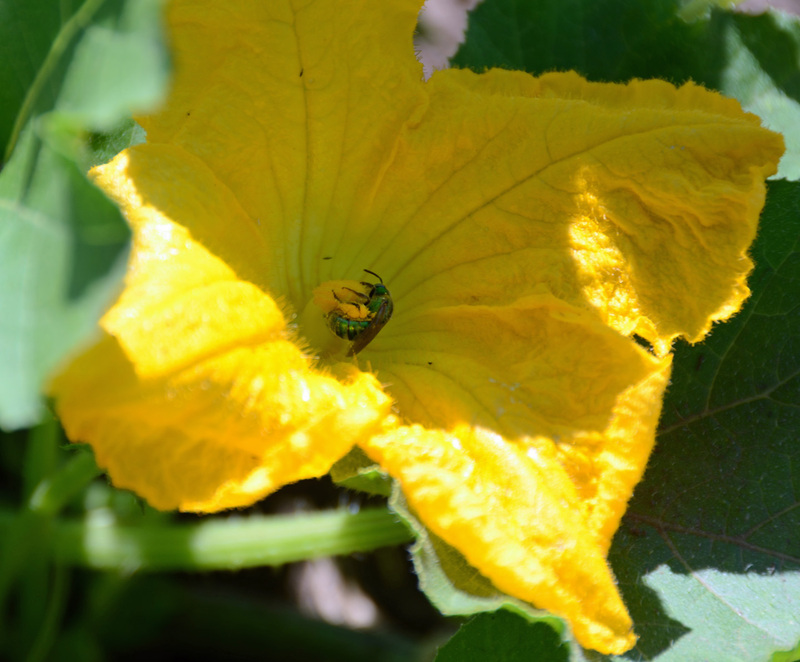 Here is a bee (it only looks green… it’s not a fly) gathering pollen from a male pumpkin blossom (the pumpkin is one of many plants that is considered “bisexual,” having both male and female flowers… more on that in a minute). Can you see the pollen on the bee’s legs? 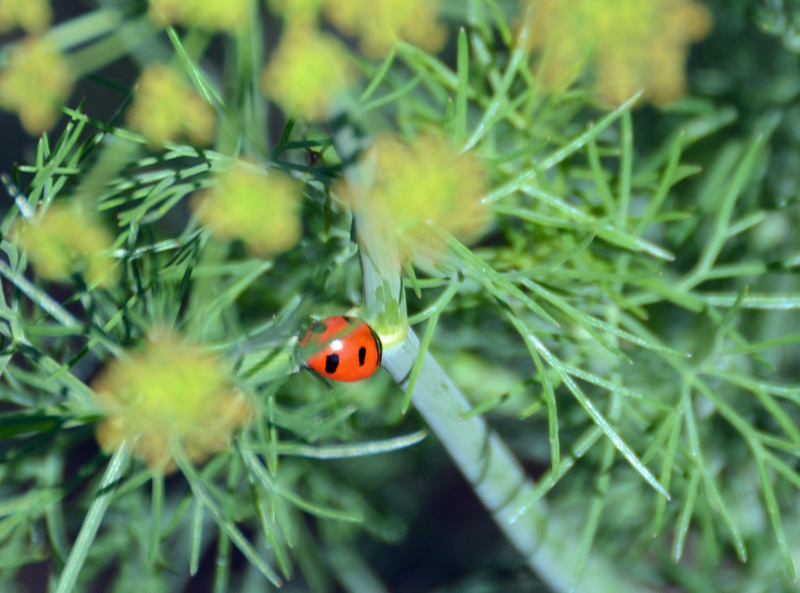 A ladybug/ladybird beetle chillin’ in the dill. Hopefully protecting it from aphids and other pests! 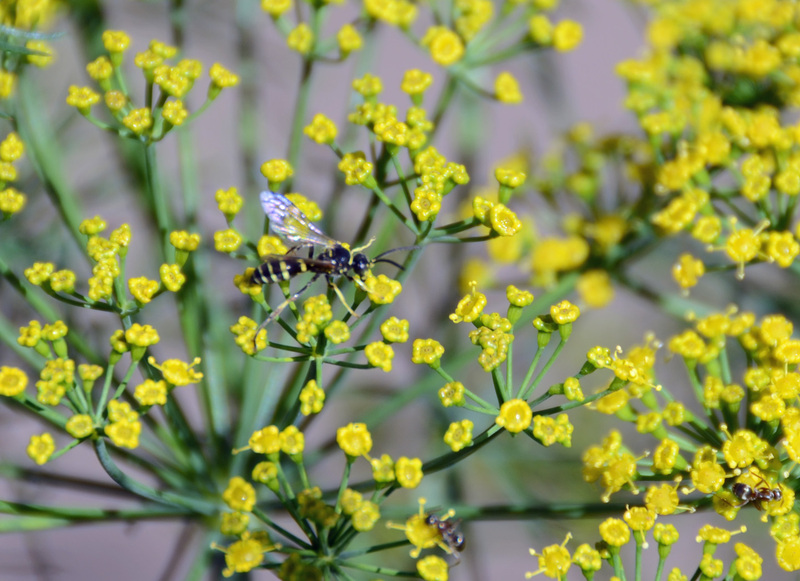 Joining the ladybug beetle in the dill is a wasp. Humans definitely value bees over wasps for their pollen spreading services, but wasps are predators and are helpful in their own right. In the lower righthand side of the picture, there is an ant. There’s another in the middle bottom of the photo. I hope the wasp was hunting ants! 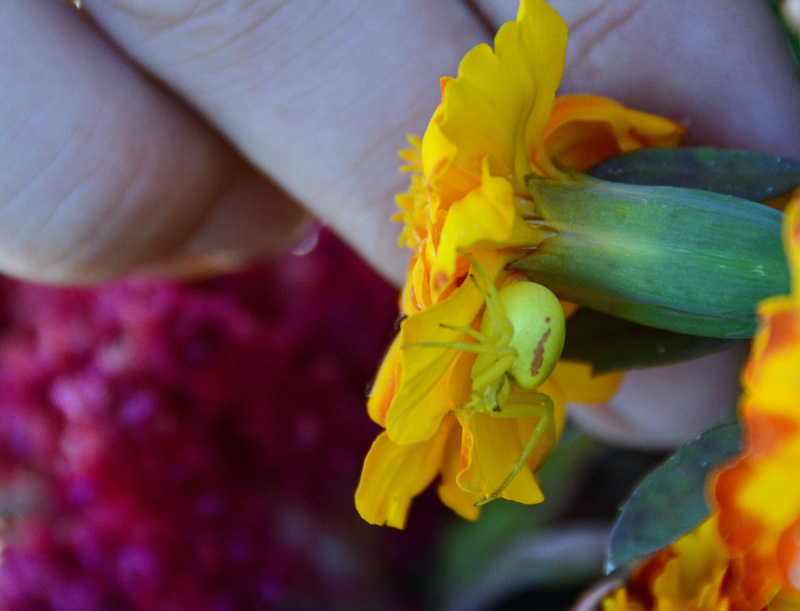 Here’s a crab spider (not sure exact kind) in the marigolds! 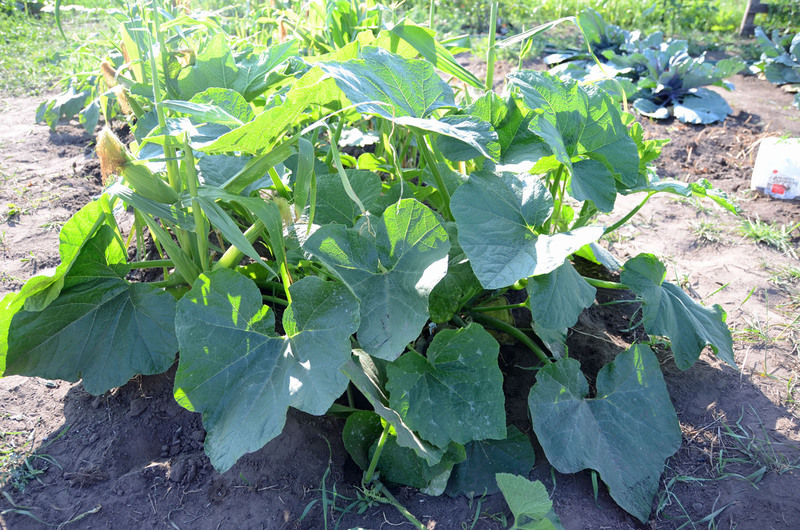 Oh, and since I mentioned the pumpkin flowers earlier, here’s a brief biology lesson: Many plants are considered bisexual or “perfect,” which means they have both male and female flowering parts. 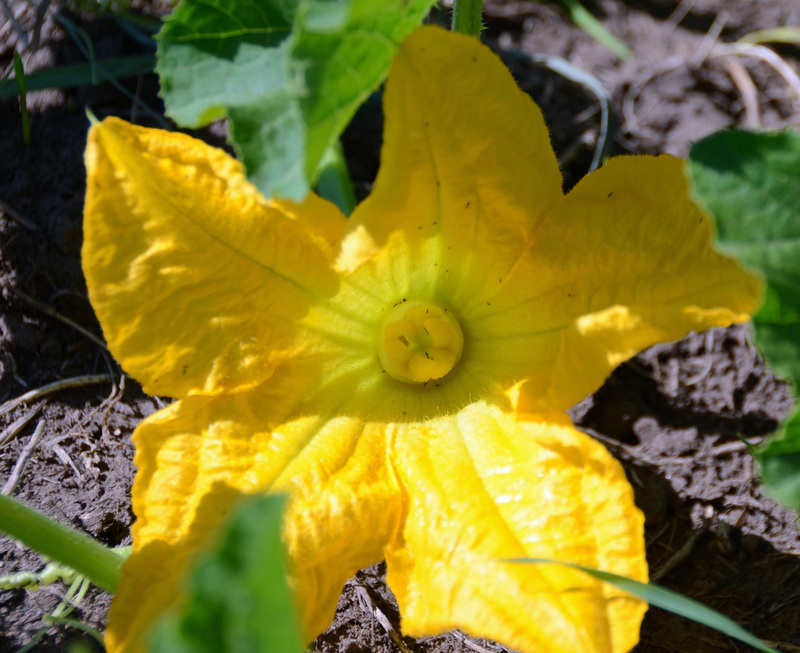 Pictured above is the male pumpkin flower with its slender, pollen-containing stamen. 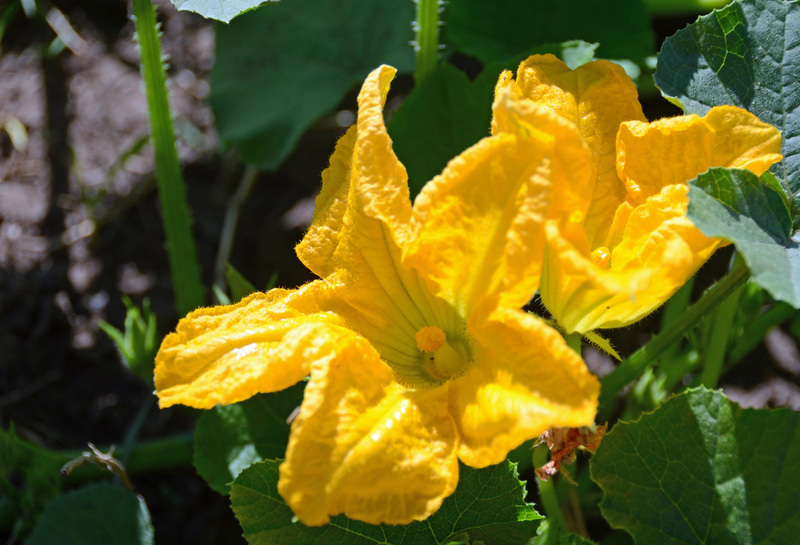 Male pumpkin flowers usually come onto the scene before the female flowers, but eventually there are both at the same time. Pollen from the stamen will be carried by bees (or you can be your own bee: pick the make flower and rub the stamen on the female flower) to the female flower’s multi-segmented stigma, shown in the photo below. 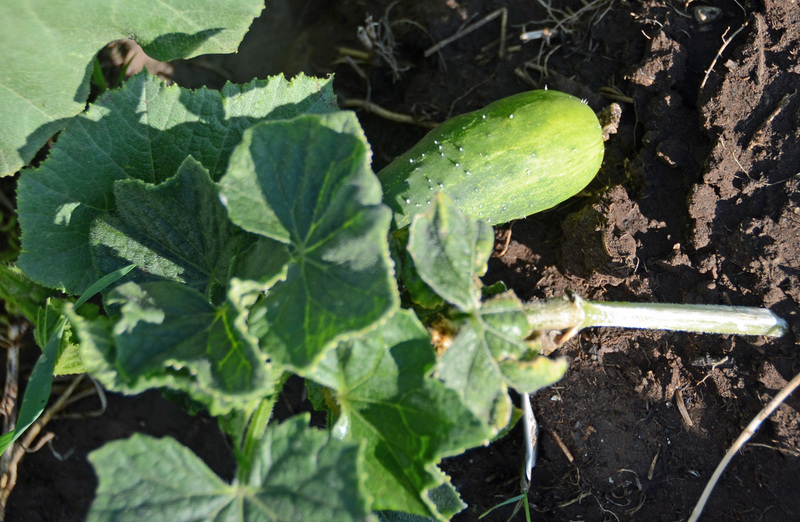 The pollenated female flower will go on to become a pumpkin! 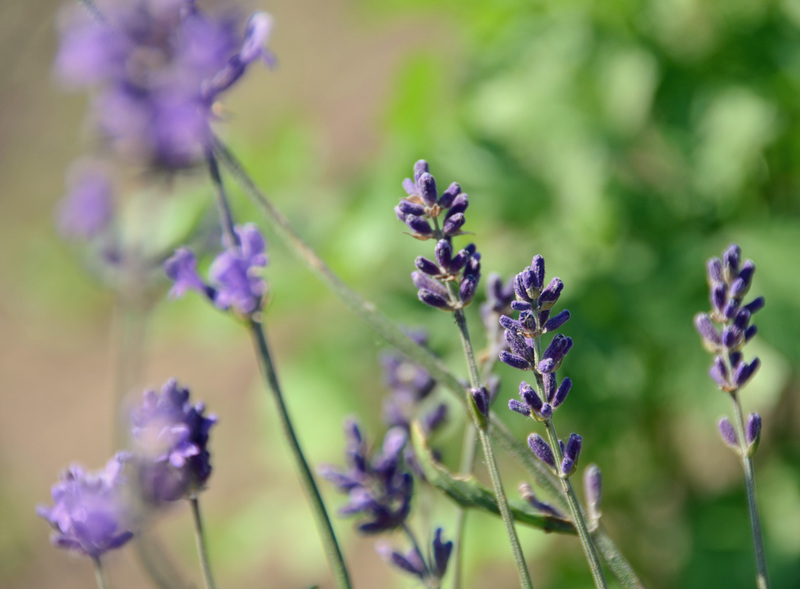 bisexuality in flowering plants (“angiosperms”) is considered perfect. Oh, the irony. Anyway, that concludes today’s bug lesson! I hope you’ve enjoyed the up-close-and-personal view of the bug world in my garden. All this talk about bugs has me wanting to re-watch “Ants.” Remember that movie? It was the more adult version of “A Bug’s Life,” and the better of the two in my opinion. Think they’ve got it on Netflix? I like roses as much as the next girl. Lilies, too. And sunflowers. Sunflowers were the main flower in my wedding bouquet. But the traditional flowers you can buy at the florist aren’t the only flowers you can use for beautiful bouquets. I’ve been enjoying some more wild-looking, nontraditional blooms lately. 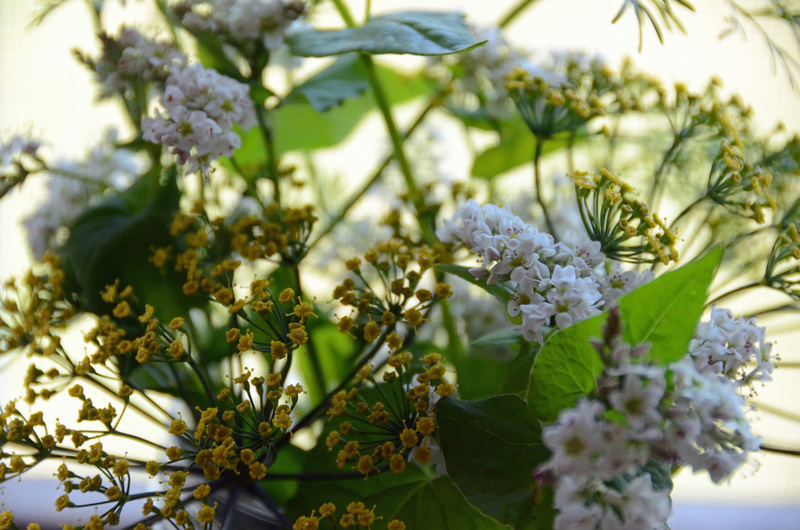 Before we turned the buckwheat under, I picked some of the stems for their lovely white flowers. I’ve added some stems from my flowering dill and cilantro plants, too. Isn’t this bouquet lovely? 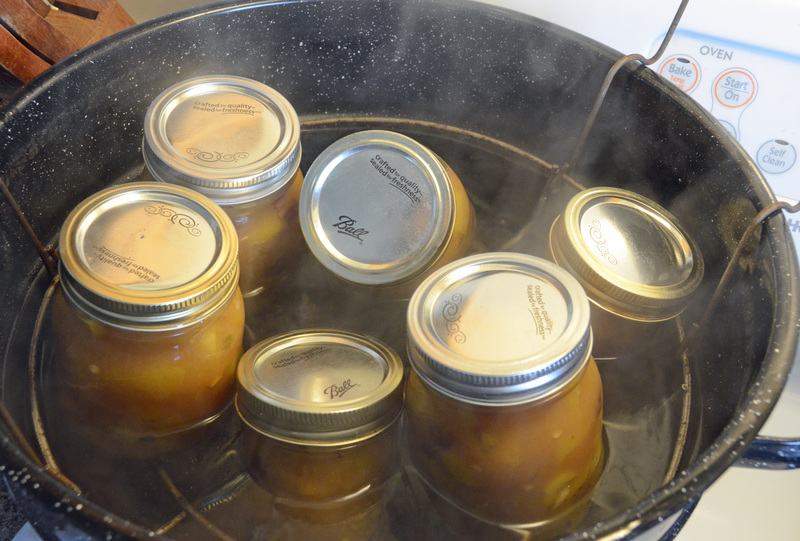 And it smells great, too! Like dill and cilantro. Can’t decide if I want some pickles or some Mexican food when I take a whiff of it. 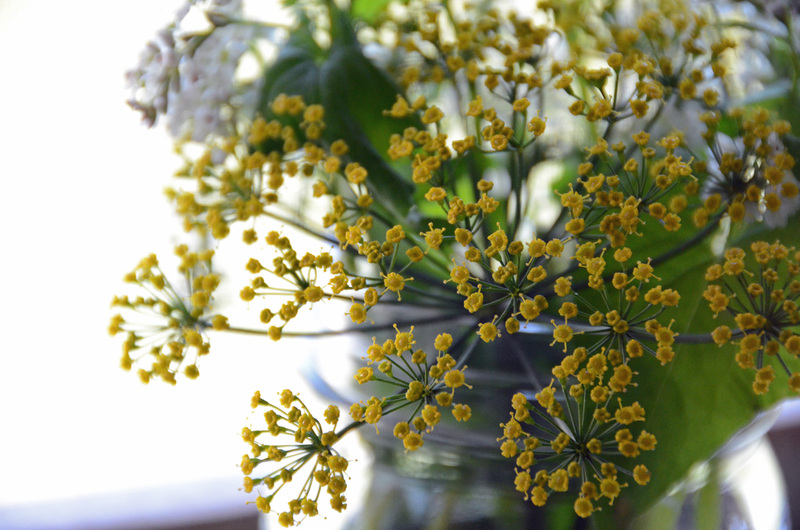 Dill is part of the Umbelliferae family. This name describes the way the flower grow. Their umbrella-like blooms are called umbels. Carrots are also part of this family. Isn’t it pretty on the windowsill? And hey, there’s our first two tomatoes! Those two are about to be lunch! 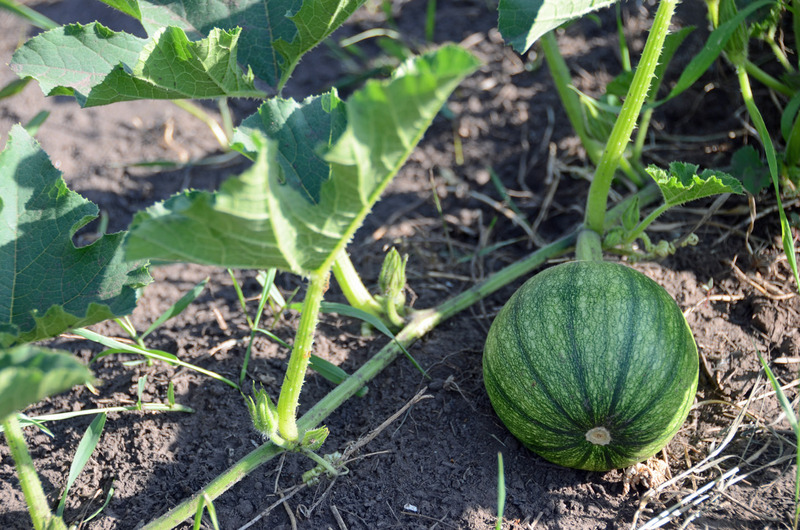 Starting now, and in the future, I plan to write occasional informational posts about growing food/living self-sufficiently/homesteading. I’m going to call this series Green Thumbs. I’m hoping to build a bigger readership in the homesteading/farming/gardening set as my goal in the next few years is to start my own CSA. I have a serious, SERIOUS desire to have my own farm. Barnheart, it’s called. That term was coined by Jenna Woginrich, one of my farming idols. Barnheart is an incurable longing for a farm of one’s own. Oh, does that describe me. And having something of a following will help me gain customers, too, when I am finally able to achieve my dream. There’s a lot standing in my way, the chief concern being how the heck I am going to afford land where I live. I will have to compete with people selling out their land for development into subdivisions (cows not condos, people!). Retiring farmers/landowners can get a lot more money for those subdivisions than they can from a young family who wants to farm, even with the crappy economy. We need to find someone who wants to see their land remain a working farm, and who is committed to that end. I’m looking into land link programs, which help aspiring farmers find folks selling land. I figure it can’t hurt to join now, since it will probably take years to get linked up, if ever. We plan to let our local extension agent know our desire, to see if she can help us find land. There are USDA loans, and other such funds out there. We WILL buy land in the next few years. It just feels so far off now, unfortunately. 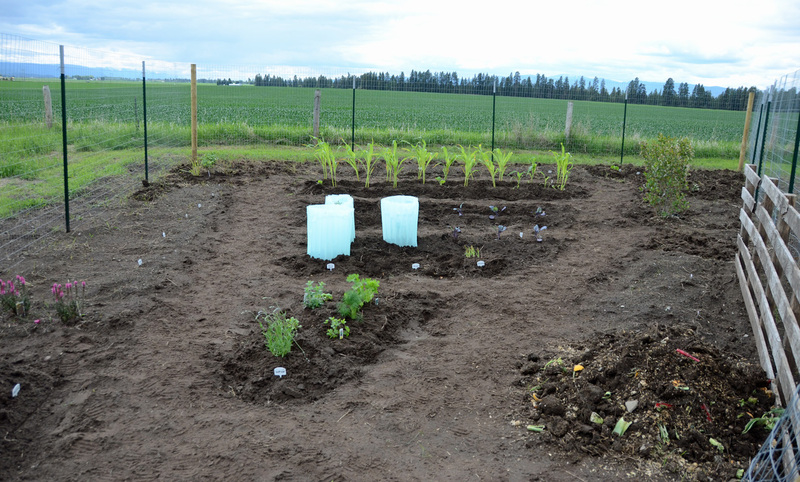 I’m trying to find comfort in my garden, which is doing very well, and considering it practice for the future farm. 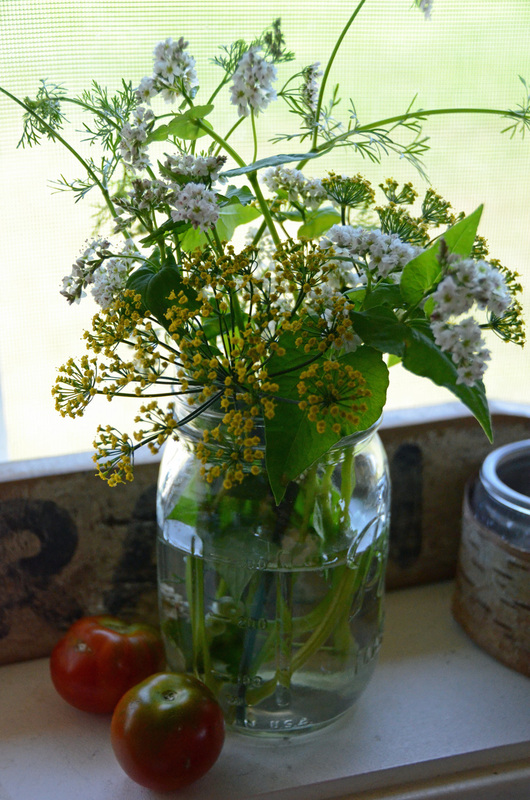 So anyway, the first Green Thumbs post is about buckwheat. Buckwheat is such a neat crop, I thought it would be a good starting point. Buckwheat is a cereal grain, but has an amino acid composition nutritionally superior to ALL cereal grains. It has a lots of lysine. 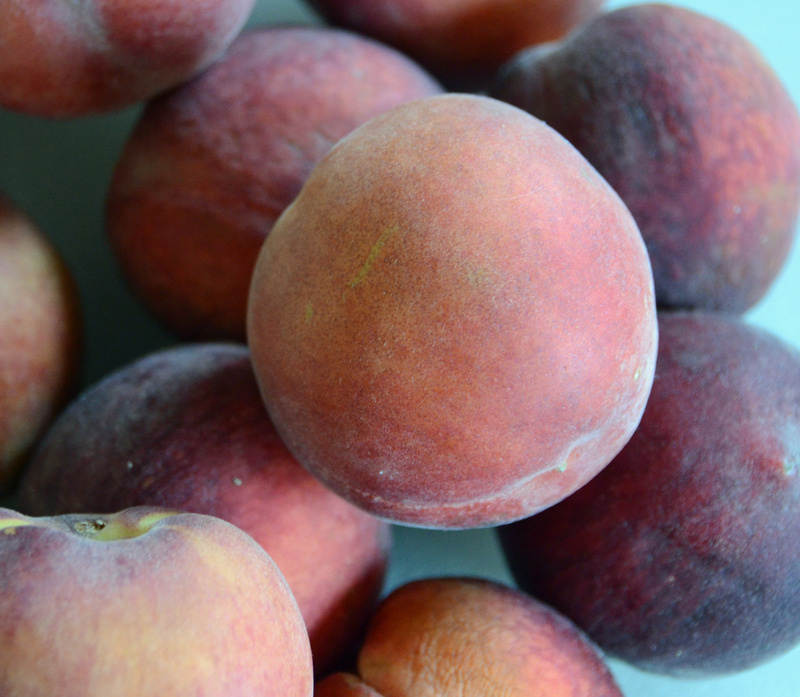 Did you know the amino acid lysine helps get rid of cold sores? In addition to buckwheat’s use in flour (buckwheat pancakes are awesome! 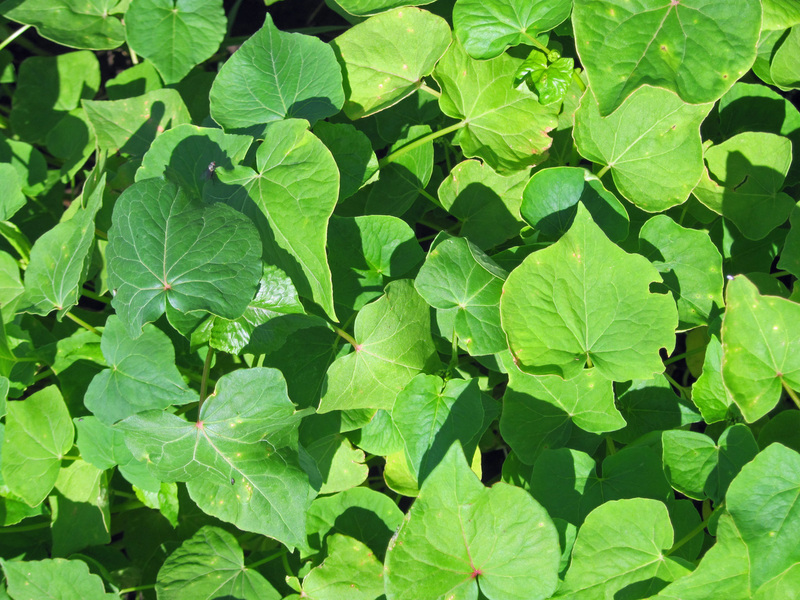 ), buckwheat is also a great smother and green manure crop. 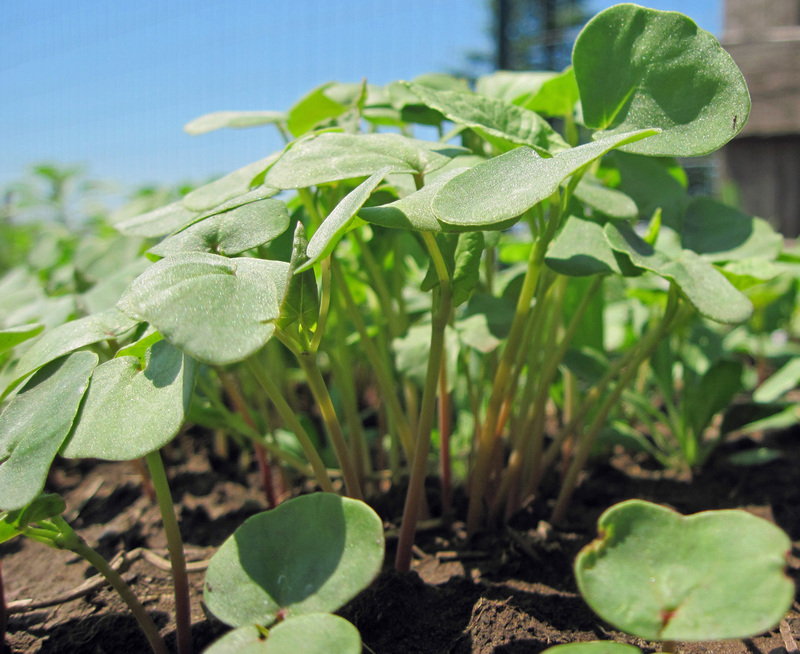 Because buckwheat germinates and grows so rapidly and because its canopy is quite dense, it can be used to smother weeds. These include the horrible quackgrass, Canada thistle, sowthistle, creeping jenny, leafy spurge, and Russian knapweed. In Montana, quackgrass, knapweed, and leafy spurge are common invasive weeds. In my garden, I am using buckwheat to smother grass, lambs quarters (which is actually quite tasty and great in salads! ), and thistles. As you can see in the above photo from my garden, buckwheat’s understory shades the ground below and crowds out weeds. Buckwheat is also a green manure, as I’ve mentioned before. 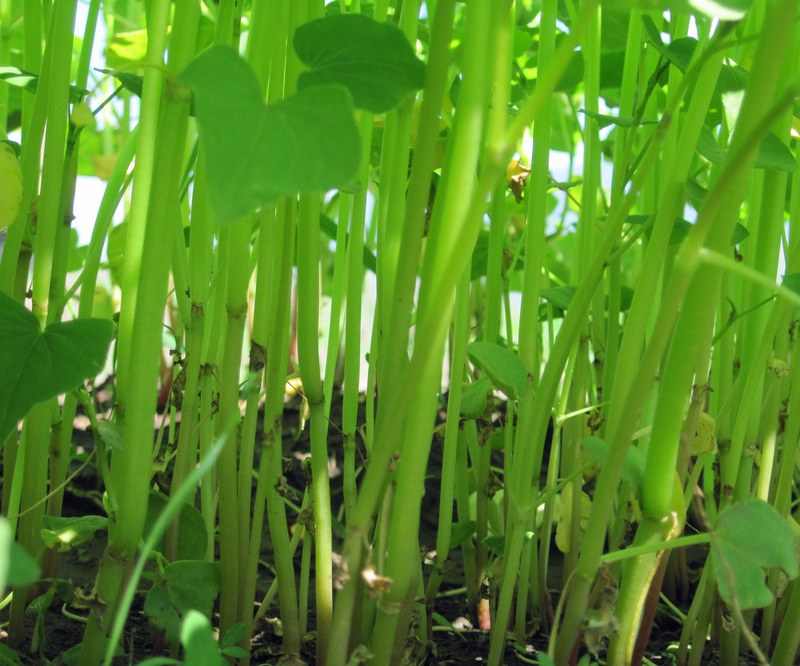 A green manure is a crop that one turns under once it flowers to add nutrients to the soil. 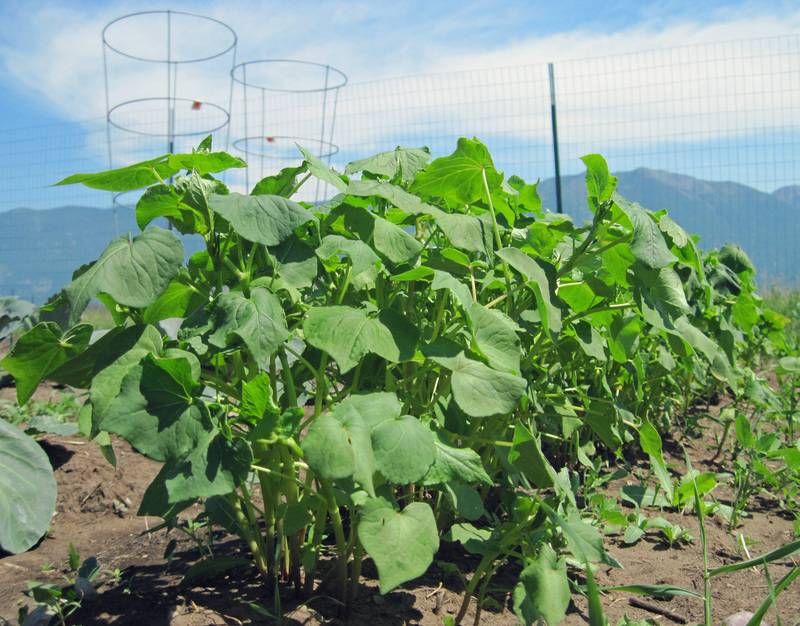 The plant material of buckwheat decays rapidly and the resulting humus improves the soil, the soil’s ability to hold moisture, and the nutrient availability to succeeding crops. 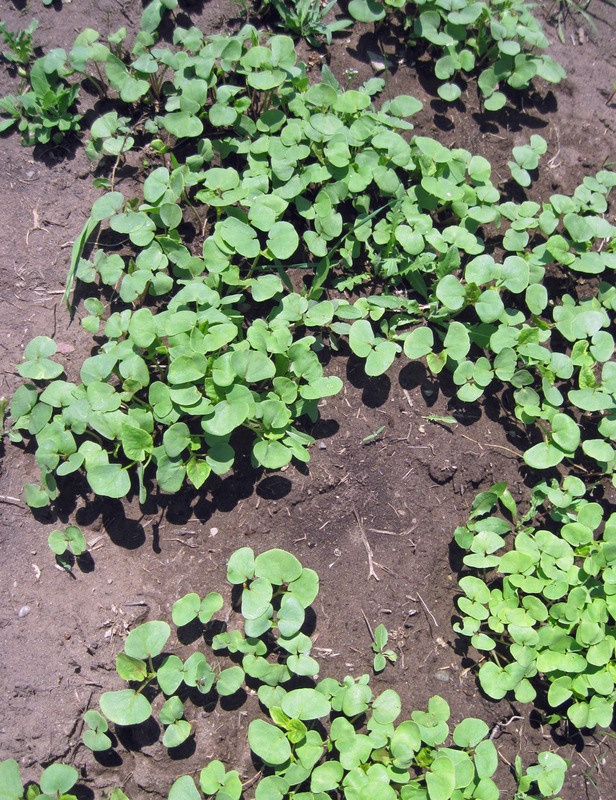 Buckwheat thrives in poor soil. 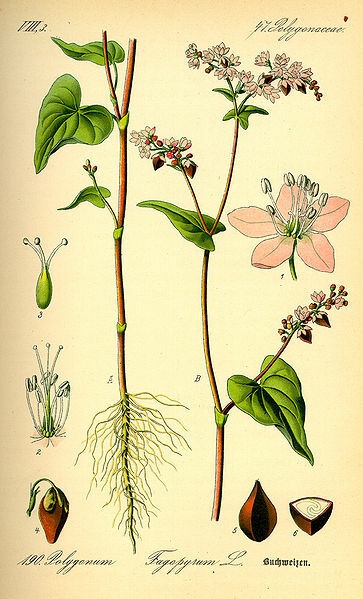 Later in the summer, when many flowers have expired, buckwheat’s flowers are a crucial source of nectar for bees. 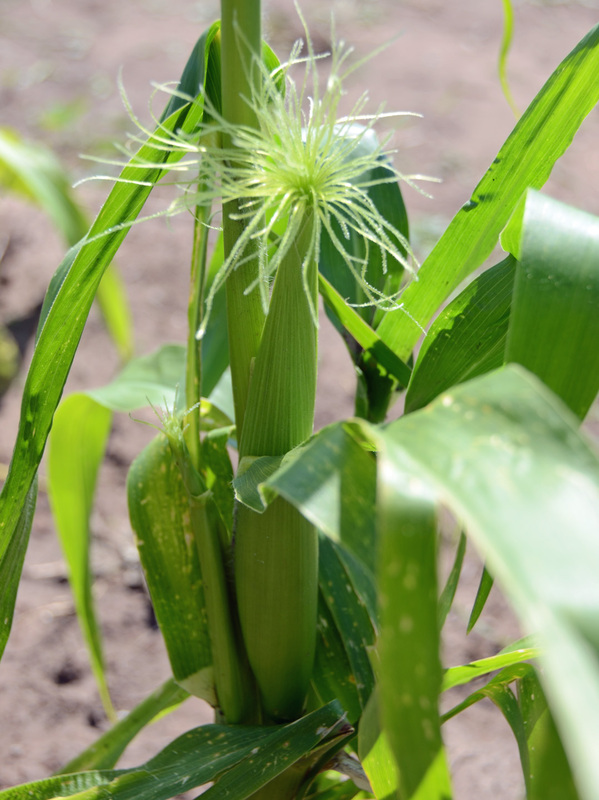 It is an indeterminate plant, which means its continues to grow until killed by frost. 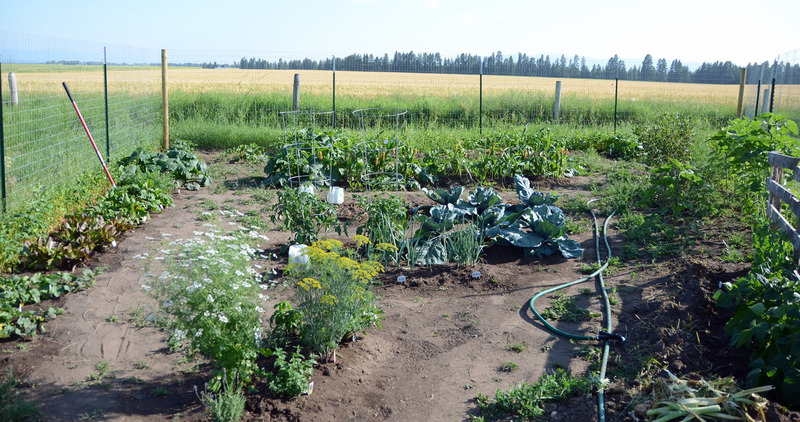 In the northwest, it’s typical to get three crops of buckwheat during a short growing season, as long as it’s tilled under at flowering. I’m planning to leave my current crop in flower for a few days, maybe a week, for the bees. Then I will turn it under for the green manure and plant another crop of buckwheat. At the back of the garden, one of my beds is really struggling with grass. I’m planning to plant the entire bed to buckwheat next summer, to beat back the grass. It is partially planted to buckwheat now. As you can see, there are plenty of weeds around the buckwheat, but there are few in the buckwheat stand. And this taller stand is about to flower, too! We haven’t decided yet if we’ll try to get some buckwheat from our last crop of the season to use for flour, but I think we’re going to try. We’ll pick it by hand and mill it ourselves, if so. 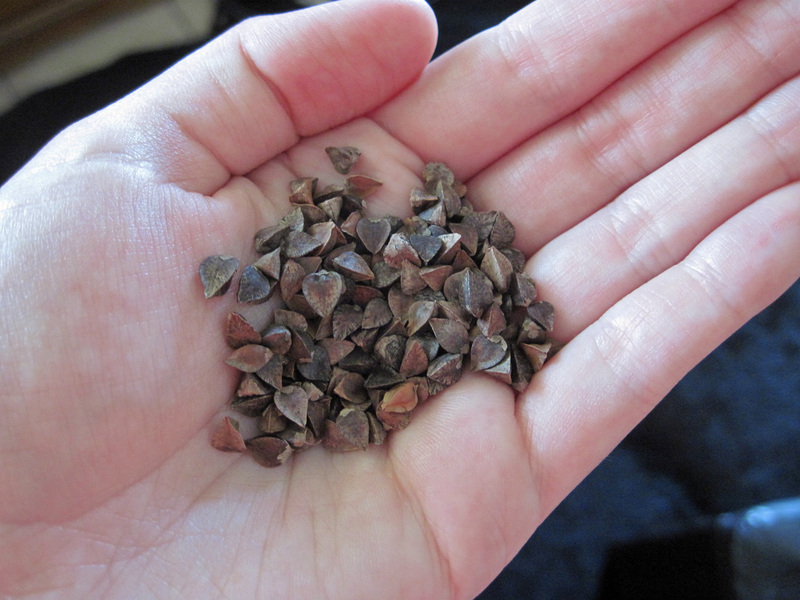 EDIT: To turn over your buckwheat, cut it if it’s pretty wooly, as mine is, like you would grass (I’ll be using scissors or a pruner), so that there isn’t so much leggy biomass. Then using a shovel, push the biomass into the ground to a depth of 3-6 inches. 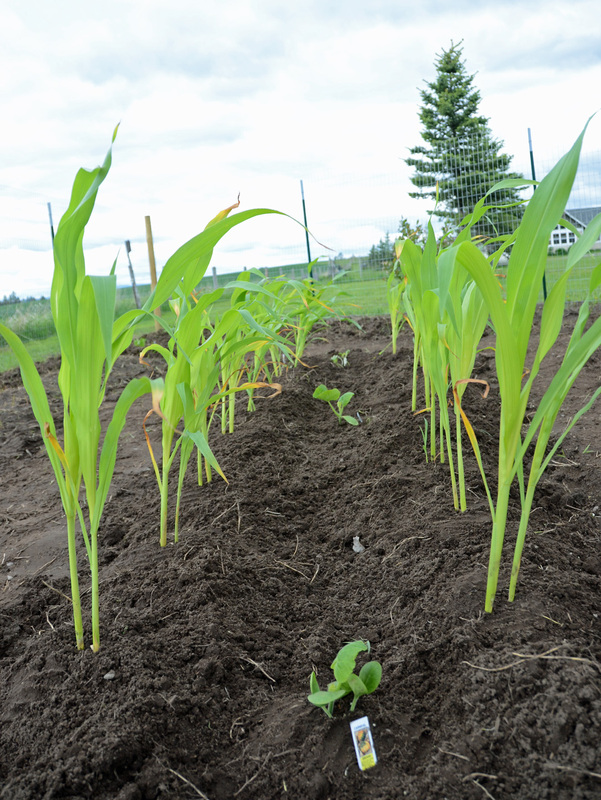 Follow with another crop of buckwheat, or if it’s the end of the season, cover the bed in mulch or straw until spring to preserve your topsoil. I hope this has been helpful and informative. Please let me know in the comments if there is a way to improve upon this post, and if there’s something you’d like to learn about in the future. 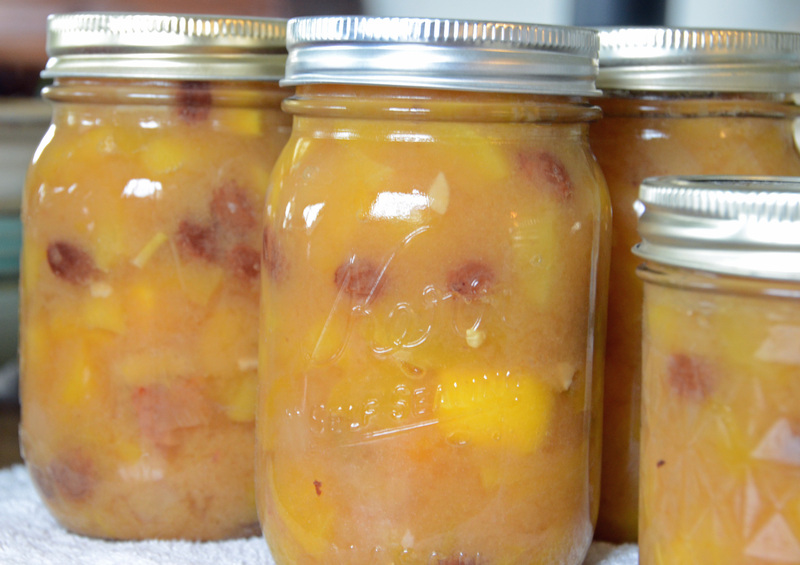 UP NEXT: Composting. 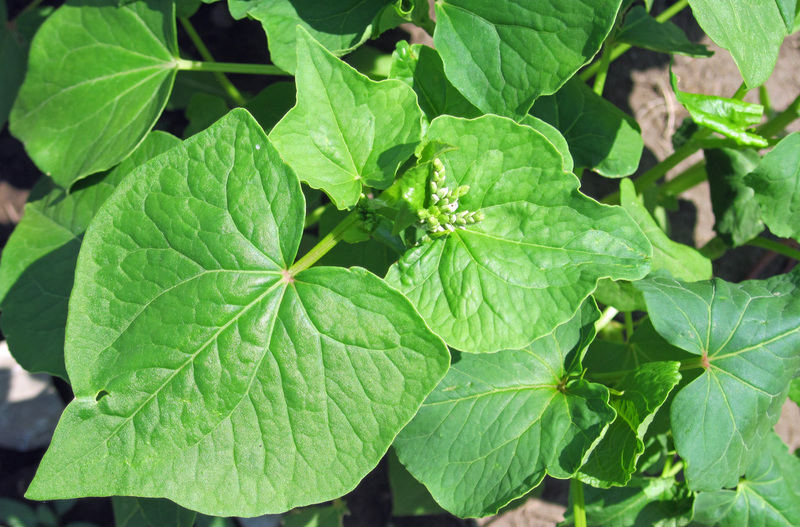 Special thanks to Purdue University’s horticulture department for this fantastic article about buckwheat. 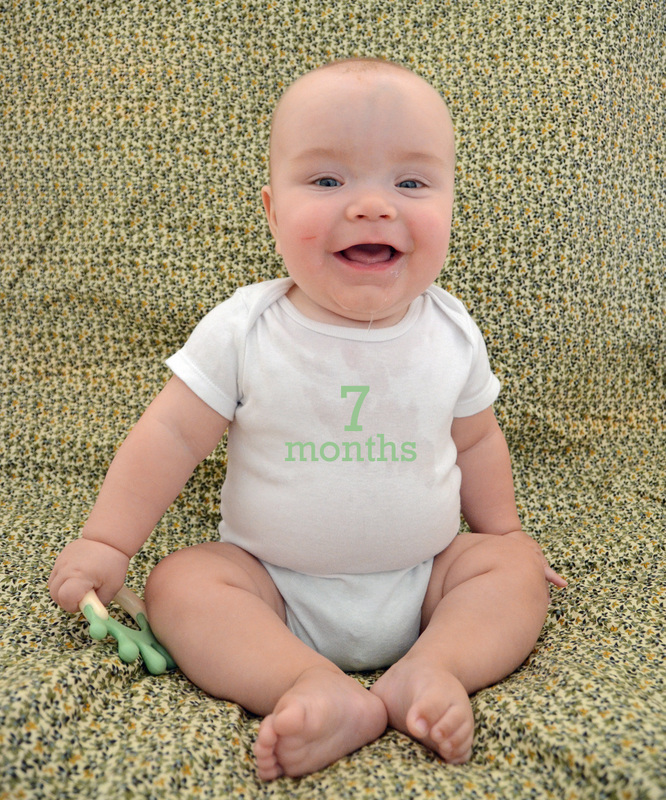 My son likes to play with his feet while he’s breastfeeding. 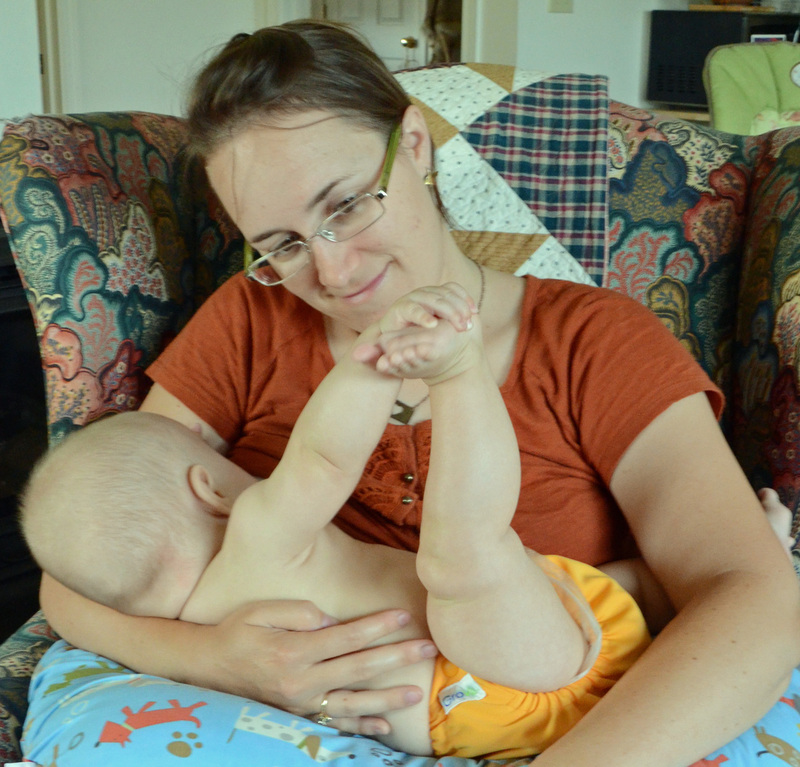 Breastfeeding yoga, as it were. It’s the little things like this that I hope to always remember. Gardens are beautiful places, and that’s one of the many reasons I enjoy spending a lot of time in mine. I love my stroll across the lawn every day to the garden. I like watching the growing things, and smelling the unique and instantly recognizable scent of soil and plants working together to feed me. A few days ago, I found a toad chillin’ under the broad leaves of one of the strawberry plants. Birds perch on the fenceposts. Butterflies and bees flit about. When we turn over the compost pile weekly, worms twist about before burrowing back into the pile (doing exactly what they’re supposed to be doing in there!). 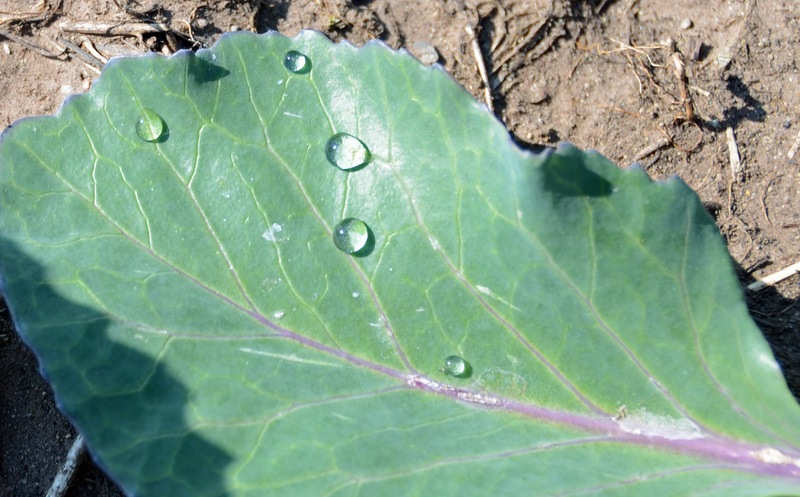 Drops of morning dew on cabbage leaves. Can you hear the ears a-growing? 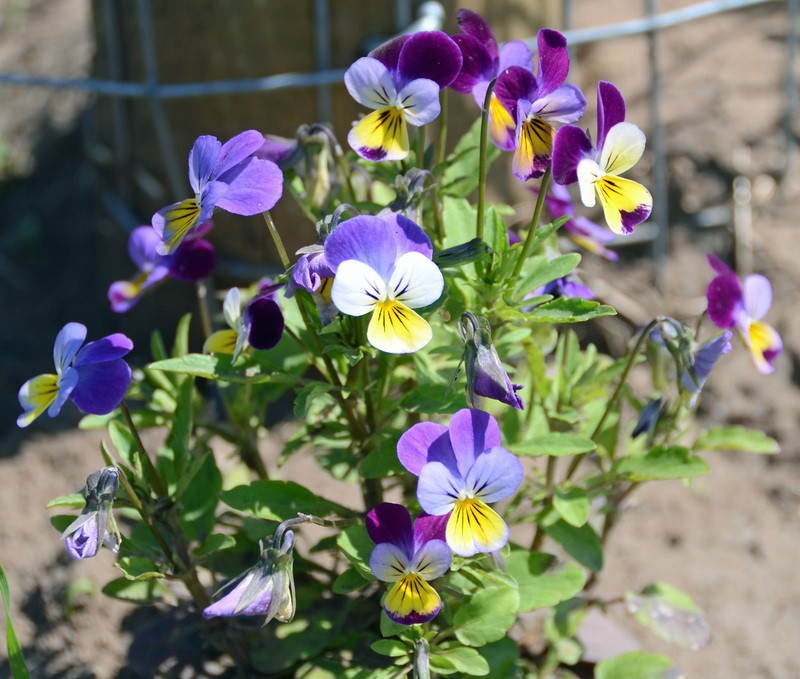 Johnny Jump Ups, planted around the perimeter of the garden.